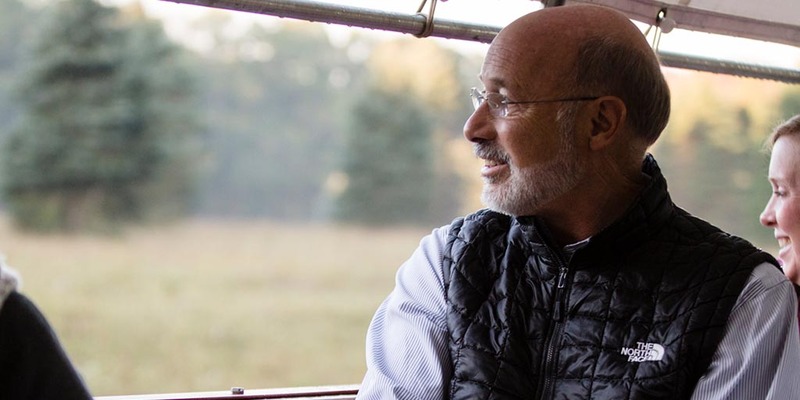 Harrisburg, PA – Today, Governor Tom Wolf announced seven new low-interest loan approvals through the Commonwealth Financing Authority that will help small family farms make the necessary capital improvements to sustain and grow their livelihoods in Adams, Bedford, Berks, Columbia, Lancaster, Northumberland, and Snyder counties. The funding, approved through the First Industries program, will assist farmers with construction costs, help farmers start businesses, and enable them to acquire land to facilitate expansion. The First Industries program represents an important tool to support Pennsylvania’s agricultural sector and help individual farmers across the commonwealth. Joshua and Stacy Martin were approved for a $103,600, 10-year loan at a 2 percent fixed rate through the Adams County Economic Development Corporation to acquire a 10.05-acre farm in Straban Township and begin a business raising and selling boer goats and revive a family bakery business. The goat herd will start at 29 does and one buck and grow to 50 head, and the business may expand further onto an adjacent 50-acre property. Matthew and Loretta Garman were approved for a $286,000, 12-year loan at a 3.5 percent fixed rate through the Southern Alleghenies Planning & Development Commission to construct a 22,500-square-foot cage-free layer barn on their 110-acre farm in Hopewell Township. The layer barn will house 10,000 hens and their organic eggs will be sold exclusively to Handsome Brook Farm. Ray and Jenifer Hershey were approved for a $400,000, 15-year loan at a 2.5 percent rate with a 7-year reset through the Greater Berks Development Fund to acquire the 83.4-acre farm in Bethel Township that they currently lease. The Hersheys use the land to operate a dairy farm with more than 650 cows. M&K Family Farms, LLC was approved for a $400,000, 15-year loan at a 3.5 percent fixed rate through the SEDA-Council of Governments to acquire 35 acres of farmland and construct a 55,890-square-foot layer barn in Catawissa Township. The layer barn will house 40,000 hens and their eggs are contracted to be sold to Dutchland Farms, LLC, for four years. Clayton and Deanna Andrews were approved for a $400,000, 15-year loan at a 2.5 percent rate with a seven-year reset through the EDC Finance Corporation to purchase a 115.3-acre farm property on Beaver Valley Pike in West Lampeter Township with 81 tillable acres, four farm buildings, and a residence. The Andrews will utilize the land and farm buildings to expand their crop operation. Robert, Tomilee, and Callen Foresman were approved for a $400,000, 15-year loan at a 3.5 percent fixed rate through the SEDA-Council of Governments to construct two 25,116-square-foot broiler breeder houses on their farm in Delaware Township. The broiler breeder houses will allow the family to fulfil a 12-year contract with Pedigree Chicks to produce eggs. James and Megan Adams were approved for a $400,000, 12-year loan at a 3.5 percent fixed rate through the SEDA – Council of Governments to acquire a 56-acre property in Beaver Township where they will operate a hog farm. Additionally, the Adamses will purchase Energy Recyclers, LLC, which operates a methane digester on the property that generates electricity to be used on the farm and sold back to the grid. A full list of approved projects and guidelines for each CFA program can be found on the DCED website. For more information about DCED, visit dced.pa.gov.